Repository tasks are used to share information with your team members. 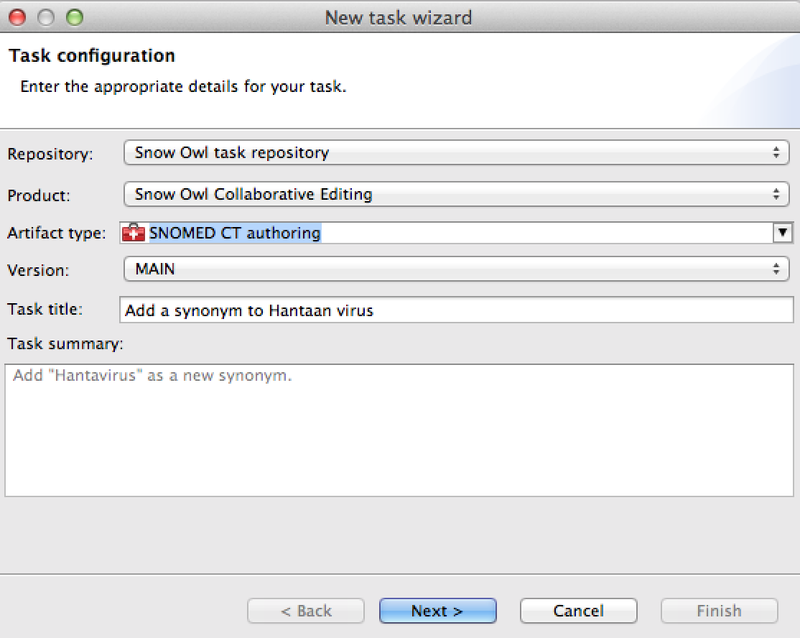 You need to have access to a shared task repository (Snow Owl server) to create and work with repository tasks. Please keep in mind that repository tasks can only be created once a shared repository has been set up on your computer. You have to be connected to the Snow Owl server to submit repository tasks, and work in collaborative more. For more information refer to Setting up a remote repository section. 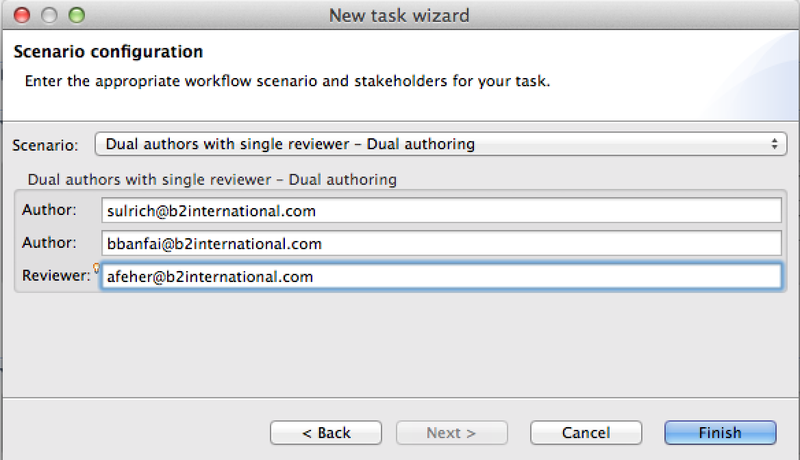 Different workflow scenarios and artifact types require different types of tasks. The task wizard provides an easy step-by-step program that will guide you through the process. This is particularly useful when tasks have to be created for multiple team members, each of them with specific roles. The first page of the task wizard applies to all kinds of artifact types and workflow scenarios. The consecutive pages will adjust to your selections. 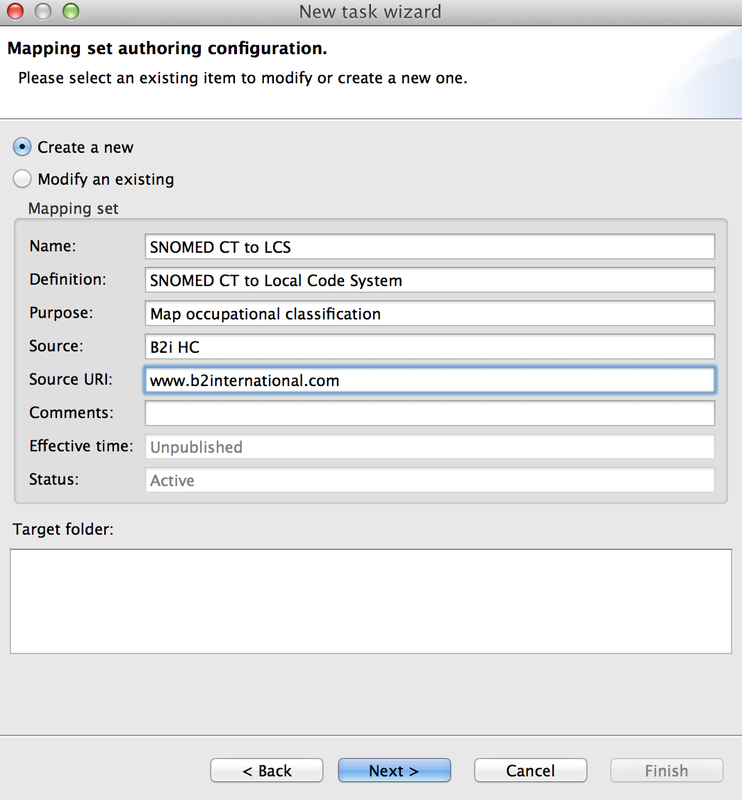 Artifact type: Select the type of work that will be done for the task - SNOMED CT authoring, SNOMED CT reference set authoring, SNOMED CT map type reference set authoring, value domain authoring, mapping set authoring, LCS authoring, ATC authoring, LOINC authoring. Task summary: Enter more detailed information about the task in this text field. Enter the username of the team members that will be working on the task. The user name is specified in your task management system, e.g. in Bugzilla. You can also use Ctrl + Space to display a list with user names. Hit'' Finish'' to complete the process. 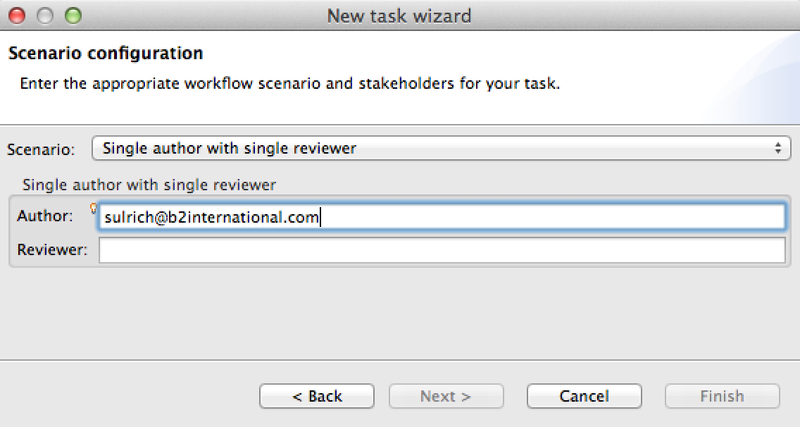 You can review your new task in the task editor that is launched upon completion. 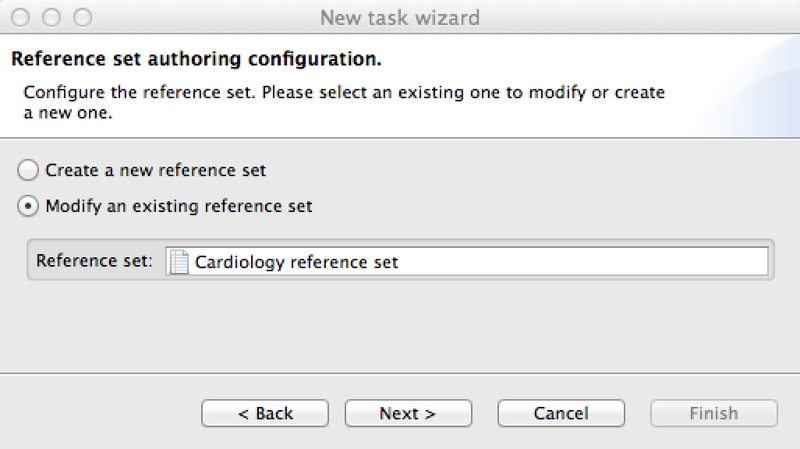 On the second page of the task editor for reference set authoring, you have to specify if you want to create a new reference set, or modify an existing one. Reference set description: Enter the name of the new reference set here. Reference set type: Simple type reference set, Attribute value type reference set. A new reference will be created upon task activation. It will be visible when working on the branch, which means after the task has been activated. 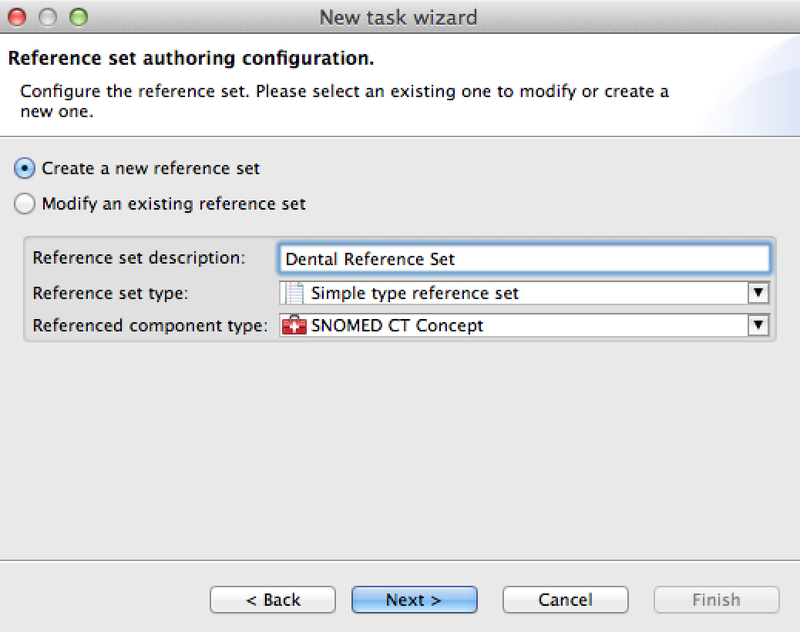 If you selected Modify an existing reference set, you have to specify the reference set you want to work on. Enter the name of your reference set, the quick search function will automatically come up and display matching reference sets. Hit Next to proceed. The following page of the wizard is similar to the one described in the section about general authoring. 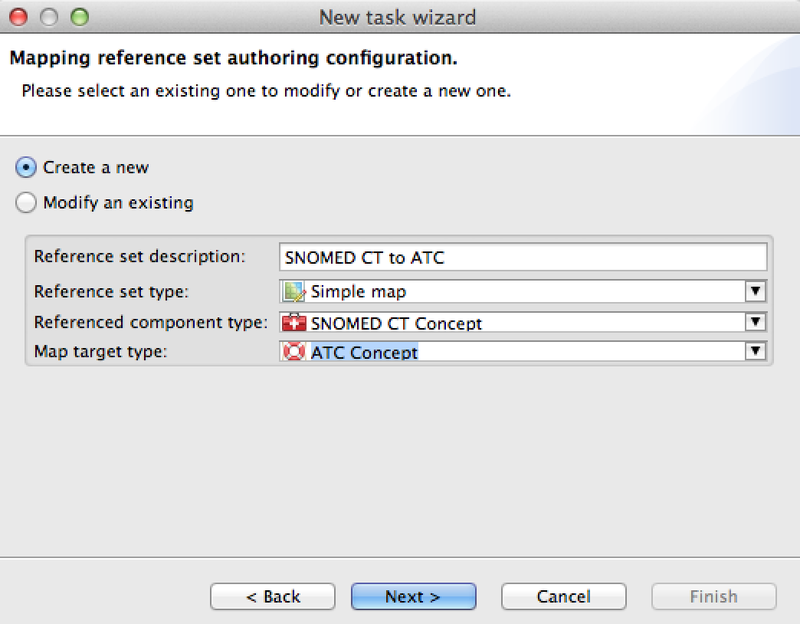 Select a workflow scenario, specify who will be working on the task, and add information about the task in the task summary. Click Finish to complete the task generation. 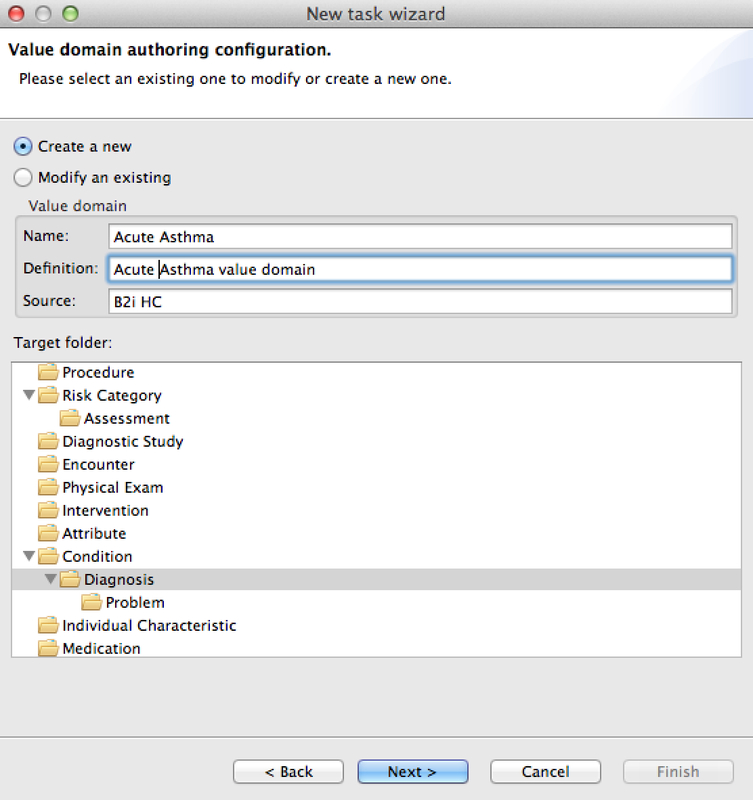 On the second page of the task editor for value domain authoring, you have to specify if you want to create a new value domain set, or modify an existing one. Hit Next to proceed. 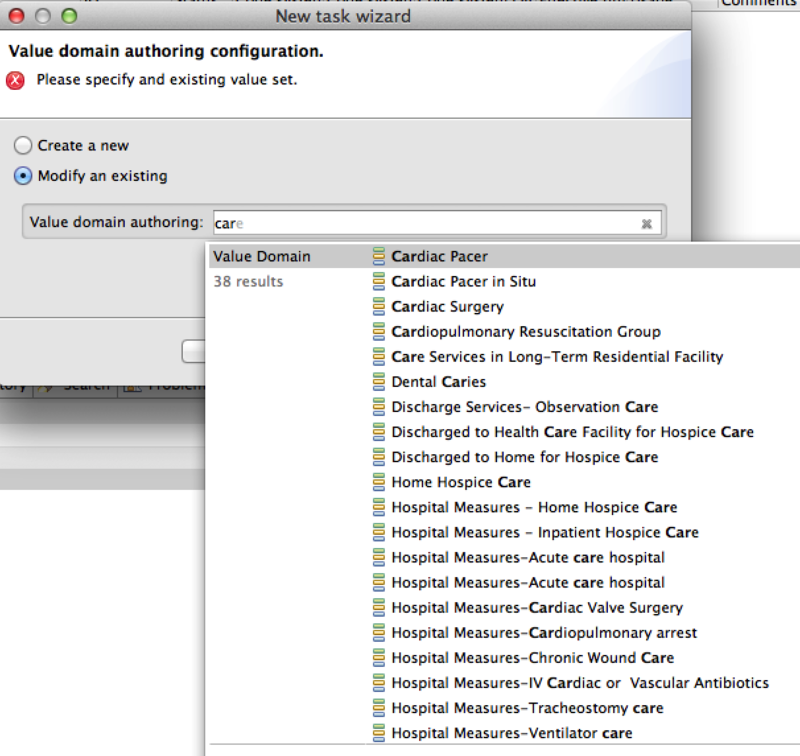 The new value domain will be created upon task activation. It will be visible only when working on the branch, which means after the task has been activated. If you selected Modify an existing value domain, you have to specify the value domain you want to work on. Enter the name of your value domain, the quick search function will automatically come up and display matching value domains. Reference set description: Enter the name of the new reference set here. A new reference set with this name will be created upon task activation. If you chose to modify an existing map, you have to specify the map you want to work on. Enter the name of the map, the quick search function will automatically display matches. Effective time (unversioned) and status (active) are set automatically. Target folders: This shows the existing mapping set folders. This shows the existing mapping set folders. If you want the new mapping set to be located in a folder, select the destination folder here. If there are no mapping set folders in Snow Owl, this field is empty. If you chose to modify an existing mapping set, you have to specify which one you want to work on. 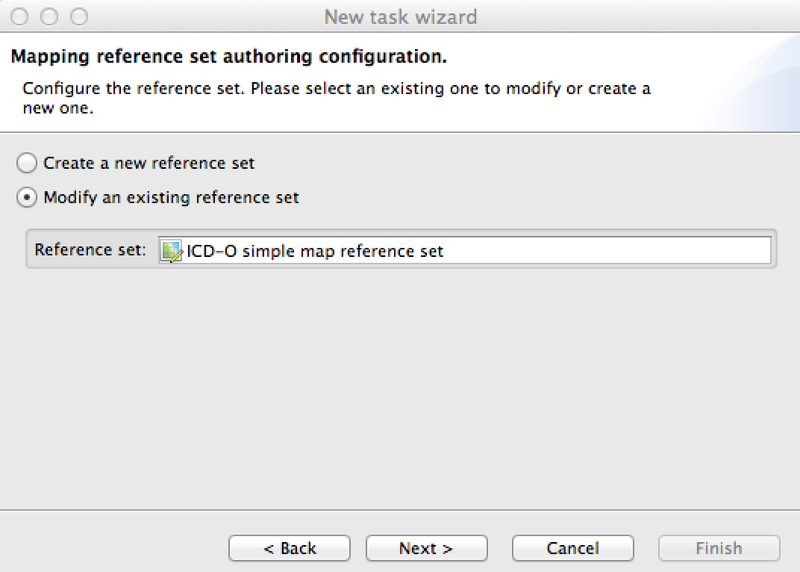 Enter the name of the mapping set, the quick search function will automatically display matches.